I love DIY home decor. Be that knitting, crocheting or sewing something. I'd also like to do more with wood but at the moment I don't have the necessary materials, tools or space to do this. Therefore I currently concentrate on sewing for home decor. For this purpose I mainly sew things like placemats, tablecloths or pillowcases. A couple of days ago, when browsing through Instagram, I found this very cute post showing a bouquet of fabric tulips. According to the caption, the instructions to sew these tulips is available online for free. I immediately checked the website and went to the fabric store on the very same day to buy suitable fabric and other necessary materials. 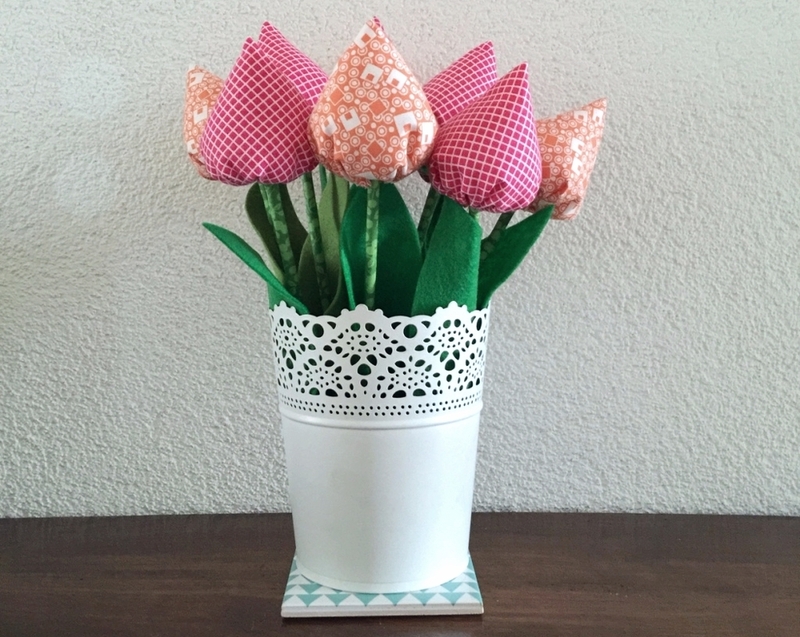 Sewing the tulips is quite easy but requires some patience depending on how many tulips you plan to make. I made 10 and it took me about 3 hours to finish them all. I spent most of the time preparing the flower stalk. In the instructions they suggest to use double-sided tape to stick the fabric to the wooden sticks that will be the stalks. I didn't have double-sided tape and decided to use glue instead. It was rather difficult to glue the fabric nicely to the sticks without creating too much mess. I found that the easiest way was to do it in two steps. In a first step, I glued only the first part of the fabric to the stick and waited for it to dry. I then put some glue on the other end of the fabric strip and rolled the wooden stick in. Other than that, creating the tulips is very easy and fun to do. The instructions are very good and easy to understand. Just make sure to have all necessary material at hand (e.g. the wooden sticks, filling material or - I highly recommend - double-sided tape). I'm very happy with the result and love that the tulips bring a little spring into our home. I put them into a cute vase and find they light up the room. I also love that it's possible to vary with the colours and I'm already thinking of creating more. They are also a great gift for family and friends.